We are all familiar with the benefits of menthol when we are suffering from the winter visits of the Common Cold, and what better way would there be than enjoying a cool vape and at the same time allowing the menthol E-Liquid to get on with its work? We offer this liquid together with eight other flavours in 100ml bottles providing 80ml of nicotine free e-liquid, allowing you to choose whether or not to add nicotine if you wish. To see how this would work we give as an example that if you wished to make a 100ml bottle of liquid into one containing 3mls of nicotine, simply add 2 x 10ml bottles of nicotine shots, nothing could be easier, you get you nicotine shot and also the benefit of menthol’s cooling effect. Naturally the Sub Zero 100ml Menthol Shortfill E-Liquid meets the exacting standards demanded to meet TDP requirements, and if menthol is not your vape of choice, we can offer Lemon, Iceberg, Forest Fruits, Blueberry, Cherry, Raspberry, all for the same low price of £9.99, with the nicotine option at £1.20, or two bottles for £2.00. A cool way to continue to enjoy vaping. Even some smokers agree that the smell of second hand cigarette or pipe smoke can be offensive and although with the rigid rules affecting where we can enjoy a smoke, the smoke in our homes, or those of our friends, can now be a pleasant aroma of freshly baked sugary cake! 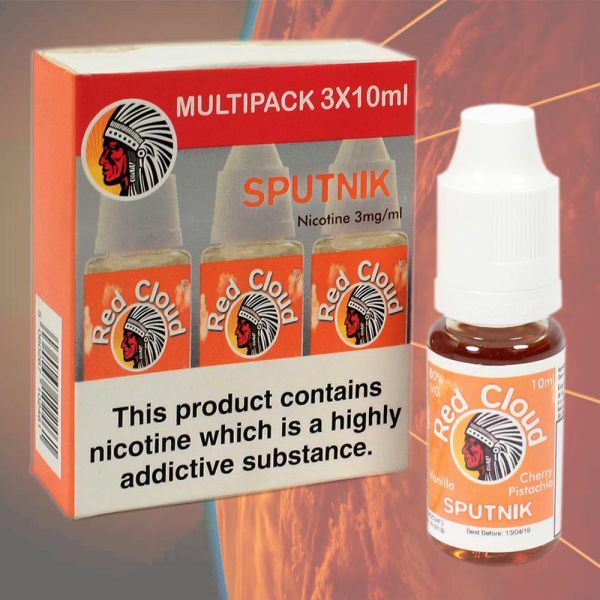 This is thanks to Red Cloud Sputnik with their a composition of Vanilla, cherry and pistachio and ot is this trinity of flavours that gives us a great liquid to load our vaporizers that is sure to fool anyone entering the room that you really are smoking a very desirable dessert! This premium E-Liquid contains 3mg per ml of nicotine and is guaranteed to consist only of pharmaceutical grade nicotine, propylene glycol and vegetable glycerine in a perfectly balanced 80%VG to 20%PG mixture. It is also Diacetyl free as well as being free of oil based flavours, dyes and colouring. Manufactured to exacting standards in the UK and is offered by us in a 3x10ml bottle multipack. All bottles come with a ‘Press and Turn’ child proof cap as well as an integrated nozzle for you to easily refill your cartridge. Grab a pack of these and treat your friends or family to your own great “bake off” smoking session of pleasant vanilla, cherry and pistachio, or one of the other flavours that may take your fancy. 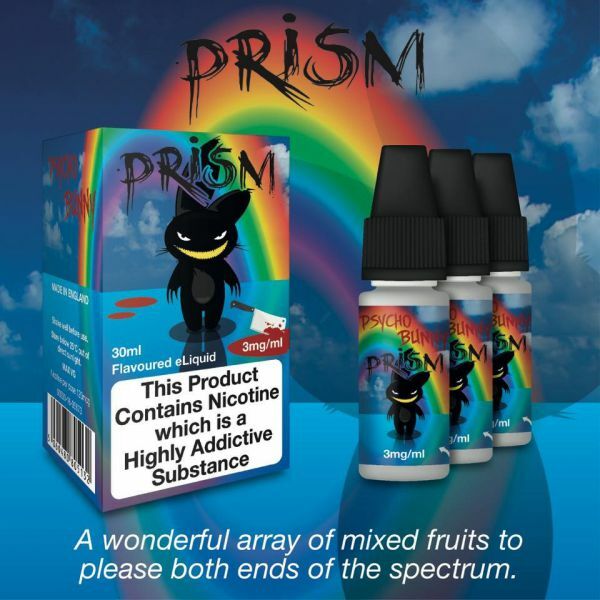 Whilst we offer a comprehensive range of E liquids for the discerning vaper, if the number of repeat orders is anything to go by, then the Psycho Bunny Prism with their selection of mixed fruit flavours is firmly established as favourite amongst our vapers. The Psycho Bunny range of E-Liquids from Eco Vape offer distinct fruity flavours and the E-Liquid offers the full spectrum, from sharp to sweet. We do know that Eco Vape are a UK based company that’s committed to providing vapers with the highest quality, best value E-Liquid, and that their products are pretty much guaranteed to satisfy even the most seasoned and very discerning vapers. They manufacture TPD compliant E-Liquid in the UK to the highest standards. In common with most E-Liquids produced here in the UK, these are comprised of up to 4 ingredients: PG or Propylene glycol, VG or Vegetable Glycerine, the important flavouring, which is normally the same as used in food, along with nicotine, unless you decide on zero nicotine content. We offer the Psycho Bunny Range Prism liquids in nicotine strengths of 3mg or 6mg and they are supplied as three 10ml bottles giving a total of 30mg. The VG to PG ratio is 80/20 meaning that the liquid is quite thick best suited for either a sub ohm tank or a Rebuildable Dripping Atomizer, (RDA) or a Rebuildable Tank Atomizer (RBA) if in doubt contact us for advice. There are some great fruity flavours waiting, join in with the ever growing numbers enjoying Psycho Bunny Range Prism liquids. Whether you are new to vaping or perhaps are now experienced, you will know that there are a huge variety of E-Liquids and vape juices available, but what about turning your favourite essential waxes, oils and tinctures into an E-juice, to be vaped in your E-cigarette? It is possible to buy any numbers of Natural Herbal Extracts contain a wide range of organic compounds as well as waxes and plant fats, and with the help of the EJ Mix Vapour blend it is possible to turn these into an E-juice, to be vaped in your E-cigarette! This is possible because the EJ Mix Vapour Blend is unique in being a universal base for both water and oil soluble herbal essences, no matter what your preferences may be EJ Mix will produce a stable and smooth flowing E juice consistently and reliably. The process is simplicity itself, all that is needed is 1ml of EJ Mix to a microwave safe cup, along with 1 gram of herbal concentrate, which you then microwave at a high temperature for 10 seconds, then just stir to ensure it is completely mixed. You will then have produced a legal extract with a stable and smooth flowing E-juice consistently and reliably. 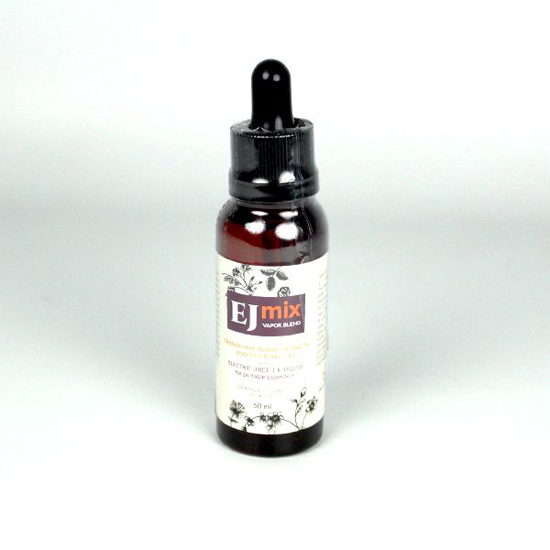 Made from a blend propylene glycol and PEG400, PEG300, and PEG200 to create a liquid ideal for suspending herbal extracts, it is available in either a standard 15ml size, or the cost saving large 50ml bottle. Increasing numbers of people are turning away from traditional cigarettes for a variety of reasons, not least of which is the cost. Huge savings can be made by “vaping” with cost savings of more than ten times less than buying cigarettes, but it has also been established that vaping is less damaging, according to Public Health England. We have a huge variety of e liquid flavours on offer including popular tobacco styles, but fruit flavours are the ones which are increasing in popularity. You can choose from 56 distinctive styles, but it is the Highland Clouds Banana Custard that is proving amongst the most popular as users reminisce about how it replicates the beautiful flavour of a very British dessert. An important ingredient of e liquids is the Vegetable Glycerine (VG); this is the ingredient that creates the thickness of the cloud, so liquids with a high VG content generally create large plumes of vapour. The 90% VG content of the Highland Clouds Premium E-Liquids ensure that you get the maximum possible cloud production whilst still maintaining an amazing amount of delicious flavour. 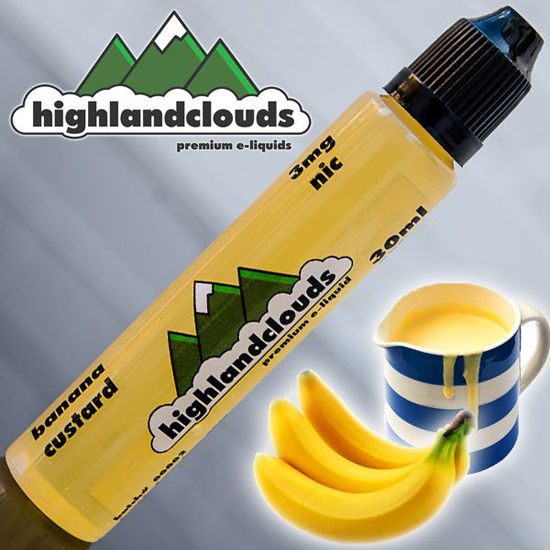 Concerning flavour, Highland Clouds Banana Custard replicates the flavour of beautifully ripe sweet bananas, with a superb coating of gorgeous, rich custard, sure to coat your taste buds. Supplied in three strengths of nicotine, 0mg, 3mg and 6mg, it is supplied in a handy unicorn bottle in 30ml and 140ml sizes, the unicorn bottle enables users to refill easily. We are confident that once you have tried this delicious banana flavoured E-Juice, returning to tobacco products will be the last thing on your mind. We now know from Public Health England that vaping is far less damaging than smoking and one of the big attractions is the range of flavours that can be bought; the variety of these liquids make the experience of vaping so much more fun. 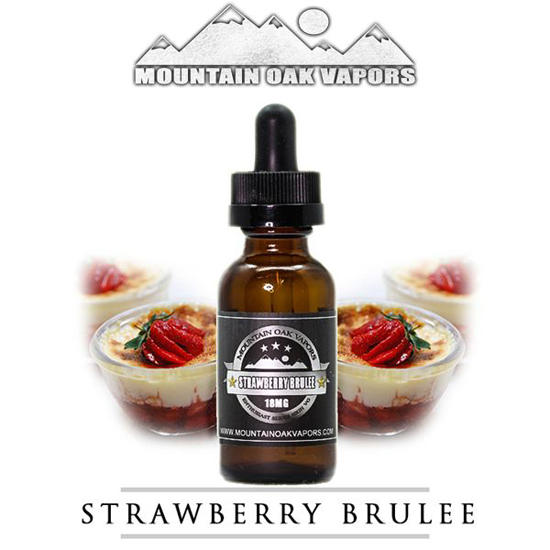 The Enthusiast Series Strawberry Brulee is a delicious strawberry dessert flavour E-Liquid that is truly delicious. We can supply this in a range of nicotine strengths, ranging from 0mg to 18mg in steps of 0mg, 3mg, 6mg, 12mg and 18mg in a 15ml glass bottle complete with dropper. The product is manufactured by one of the most respected names in the business, Mountain Vapor, an American company which has its products tested by a third party lab to ensure that it is free of Harmful & Potentially Harmful Constituents: Acetyl Propionyl and Diacetyl, with nicotine is the purest, with the fewest percentage of impurities found anywhere. We are confident that once you have tried this delicious E-Juice and find those natural sweet strawberry flavours, together with notes of creamy vanilla and roasted caramel that make this E-Juice an absolute delight to vape, you will wonder what attracted you to ordinary tobacco.